Many older schools face the same problem - their staircases have deteriorated over the years. 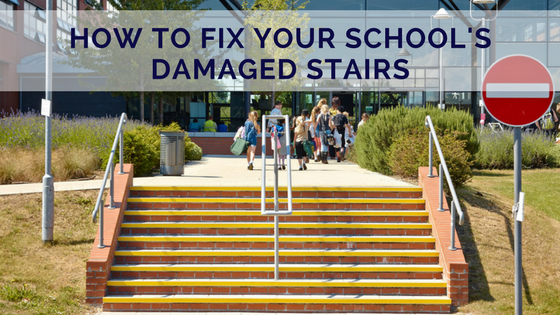 The chips and cracks on concrete stairs or the fraying and wear on carpeted stairs aren’t only unsightly, but can also be a serious danger for students and teachers. We’ve had many contractors working on school renovations come to us over the years in search of a solution. Luckily, there’s often a simple fix - adding stair nosings. While stair nosings are the norm overseas, the American market has yet to include stair nosings on all stair installations. 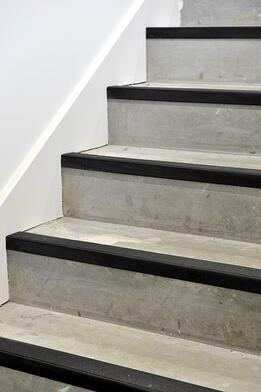 Concrete stairs seem like they’d be very sturdy, they can chip and crack over time when stair nosings aren’t used. A chip may seem like a minor problem, but it can actually affect the integrity of the step, making it dangerous for everyone walking up and down it. So, what’s the solution? It’s not feasible to go into the school and re-pour concrete. Instead, consider adding a stair nosing. It will cover up that cracked or chipped edge of the step and give it an added anti-slip property at the same time, helping to improve both the safety and appearance of the steps. The same thing happens with carpeted stairs. If a stair nosing wasn’t installed initially, the edges of the steps will look frayed and worn in just a few years. It’s typically just the edges that look old and scrappy, since that’s the area where there’s the most foot traffic. The edges are almost always the first part of the step to lose its look over time. Tearing up the entire carpet is a huge, time-consuming, and expensive project. 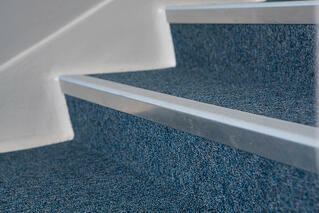 Instead, an experienced contractor can simply cut back the carpet and add a stair nosing. The worn edge will be removed and replaced with a new edging, making the stairs look neat and new again. While every project is different, using stair nosings will almost always save time and money. Let’s take the example of a frayed and worn carpeted staircase in a school auditorium (this is a project we’ve dealt with many times). Option one would be tearing up the entire carpet and replacing it. The cost would depend on the price of the carpet, which can range from $3 per square yard to $25 per square yard; the square footage of the auditorium; and the cost of the labor. You’d also have to consider the downtime involved, or how long the area will be out of use do to the renovation. On the other hand, repairing the steps with stair nosings is relatively more simple. There are just three factors that play into the cost - the labor, linear footage of the steps, and stair nosing profile. Instead of paying for carpeting an huge area and losing weeks during the carpet tear-out and reinstall, the contractors are only working with the steps. This cuts down on labor costs significantly. Additional repair costs would just include the price of the actual stair nosing profile selected based on the linear footage of each step. Many of the problems seen with the stairs in older schools could have been avoided if stair nosings were used in the first place. Stair nosings will typically elongate the lifespan of your stairs, improve their appearance, and help add safety features that are especially important in high-traffic schools. Though there are many product options on the market, we typically recommend Gradus profiles for schools and universities because of their durability, superior safety features, and many color profiles and finishes to choose from. Note, we are the North American distributors for Gradus products, particularly due to the high quality and reliability that they offer to our customers. If you have specific questions, you can always consult with one of our product experts to determine if a Gradus edging is right for you.